Spring is here – sort of! We are starting to see flowers blooming and hear bugs buzzing. Our world is coming to life with brightly colored flower petals and the sweet smells of nearby plants. Did you know there are 8 different species of bats that call Chicago ‘home?’ These nocturnal, flying mammals love flowers that are white or pale in color, large, and have a strong, fruity smell. Bats drink the nectar from flowers, picking up pollen in their fuzzy fur. 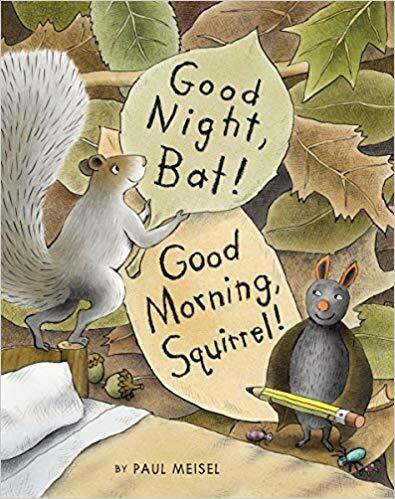 Read this book: Good Night, Bat! Good Morning, Squirrel! Read this book: Hooray for Birds! Want to help pollinators be successful in their daily jobs? Check out this Lincoln Park Zoo article on insect hotels! And as you wait patiently for spring to stick around, don’t forget to keep an eye out for the pollinators mentioned above. As we spend time in Children’s Zoo, you’ll get to know the animals that call this area ‘home.’ There are bears, beavers, and plenty of turtles. When you walk to the Children’s Zoo building, you might here wolves pitter-pattering through the forest. As spring rolls in, you will likely hear an unfamiliar “squawk squawk” from the trees above. These are black-crowned night herons! Black-crowned night herons (BCNHs) are migratory birds, meaning they move from one location to another during the summer and winter seasons. The Lincoln Park Zoo colony spends their winters in the southern United States, and returns here each spring. BCNHs like to come back to the same spot every year to build their nests – sometimes you’ll see up to a dozen nests in a tree! The male and female herons build their nest together, using sticks and grass. They share parental duties, from sitting on the eggs to feeding the newly hatched chicks. Lincoln Park Zoo offers a perfect home to raise their young, with numerous trees grown closely together, plenty of fresh water, and food all around. BCNHs prefer to live near bodies of water where they can hunt for fish, and the zoo is the perfect spot! With Nature Boardwalk and the Alfred Caldwell Lily Pool on grounds, and Lake Michigan and the Chicago River close by, the herons have plenty of meal spots to choose from. During July and August, you’ll start noticing the smaller young herons leaving the nest. Unlike their black-and-white parents, the juveniles are brown and scruffy. You’ll see them everywhere – on the ground, on top of exhibits, and in bushes. Not to worry! Areas around Children’s Zoo will be fenced off and padded with mulch so they have a safe place to land and look for food. Here at Lincoln Park Zoo, we love the black-crowned night herons! 1n 1977, BCNHs were listed as “endangered” by the state of Illinois. In 2007, the first herons arrived at the zoo. Every year, more herons are seen and, currently, the zoo welcomes Illinois’s largest colony. This summer, you’ll likely be able to see over 700 herons perched around the zoo! Partially close window shades, blinds, or drapes. Drawn shades or partial blinds reduce the transparency of windows and their mirror effect. Turn off unneeded lights. Artificial lights may confuse migrating birds. Remove plants from window sills. This can help discourage birds from flying towards them and colliding with windows. Before LEAP, take a slow walk beneath the Children’s Zoo trees. How many herons can you count?